I’m a sucker for a cheery label, or a grim label, really I’m just a sucker for any kind of effort that’s been made to make a label stand out on the shelf. That said I have learned through the years that the effort put into the label is not always reflective of the effort put into the wine. Strangely, armed with that knowledge, I still plough on, buying wines that catch my eye on the shelf, because they make me smile when I see them. 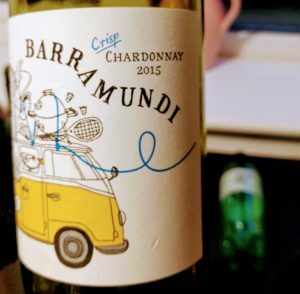 Based on that experience I didn’t have high hopes for Barramundi Chardonnay, the label seemed to suggest that it was ideal for teenagers to drink n the beach or in the park, or round the back of the gas works. It was at that kind of price point too. Even the hastily added “Crisp” designation seemed more like a serving suggestion – grab a bumper pack of cheese and onion to enjoy with your wine. The Barramundi Chardonnay ’15 wine itself was a bright cheerful sunshine yellow, but here’s where my perception changed. It smelled great. There was pineapple and lemon and a bit of lemon, it really did seem to smell of sunshine (without the cloying Ambre Solaire scent of English beaches). It was just dry with an acidity I wouldn’t call crisp, but it wasn’t flabby either, a sort of low medium. The alcohol level was just on the high side of medium, and the body on the low side. It may have been shooting for Goldilocks, but didn’t quite succeed without quite turning into a bear. Those fruit flavours of lemon and pineapple continued, with a bit of malolactic butteriness and just the slightest hint of toasted oak, more likely from oak chips than oak barrels, but working well all the same. The flavour was fresh and fun, but didn’t stay around long. This wine was better than I had expected from it’s £5.95 price point at Sainsbury‘s. It’s never going to be anyone’s favourite wine, and it’s not a classic example of anything, but if you need to stock up the fridge for a summer barbecue or party and don’t want to break the bank, you could do much worse than this wine. If you have a huge garden with a marquee, and really need to stock up an industrial fridge, then Majestic sell it only at their Calais mega store for £3.50.